A student who is college and career ready has the knowledge and skills to be successful in college and in the workplace. 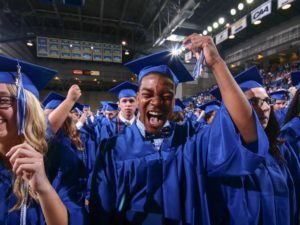 Over the past several years, Delaware has invested in initiatives to track and increase college access and readiness, with the aim of providing all students with the option of attaining a professional certificate, associate, or bachelor’s degree. Rodel has been one of many partners involved in the development of Delaware Pathways. We also support efforts to provide students with the skills, knowledge, experience, and information to be successful after high school. Five years ago, Jobs for the Future and the Harvard Graduate School of Education launched the Pathways to Prosperity Network, a collaboration of states and regions developing college and career pathways for all students. The network recently published a case study series highlighting Delaware’s work. 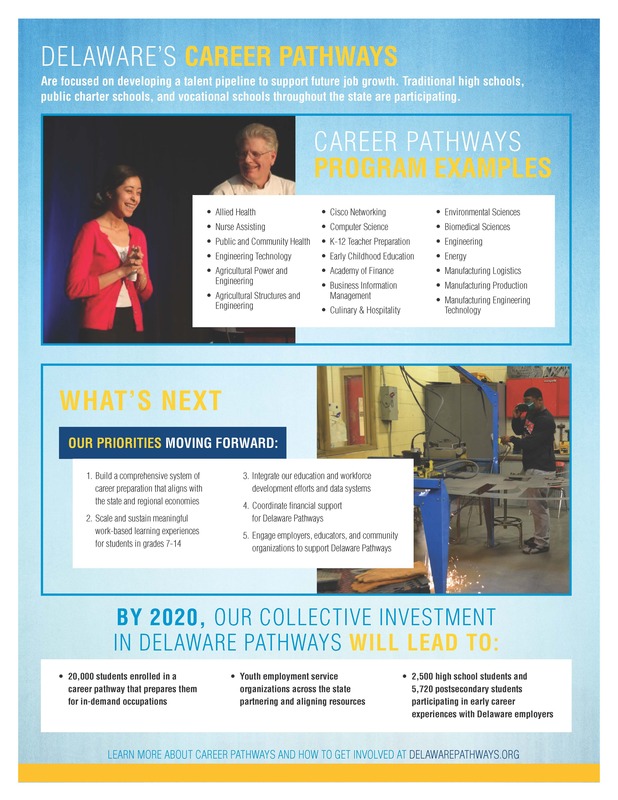 Read Propelling College and Career Success: The Role of Strategic Partnerships in Scaling Delaware Pathways. Rodel has also worked with local partners, including United Way of Delaware, Delaware Business Roundtable Education Committee and Delaware Community Foundation to determine how well college and career readiness, advising, and support services supporting students across the state. Read Supporting Postsecondary Success in Delaware: A Landscape Analysis of Student Opportunities and the executive summary. Beyond SATs: New Measures of Success for College and Career Readiness (2019): How do we know if a graduate is truly ready for life after high school? College and Career Policy Brief (2015): This brief gives an introduction to college and career preparation and an overview of the Delaware and national landscape. Additional Detail on College and Career Preparation (2015): Data and information about college and career preparation in Delaware and nationally. Delaware Public Education at a Glance (2017). From SAT scores and graduation rates to youth unemployment rates and educational attainment statistics, this resource offers a wealth of information and data on college and career readiness in Delaware. Rodel Social and Emotional Learning page for more on how Adverse Childhood Experiences (ACEs) and trauma impact students’ mental health and their prospects for success both before and after graduating high school. 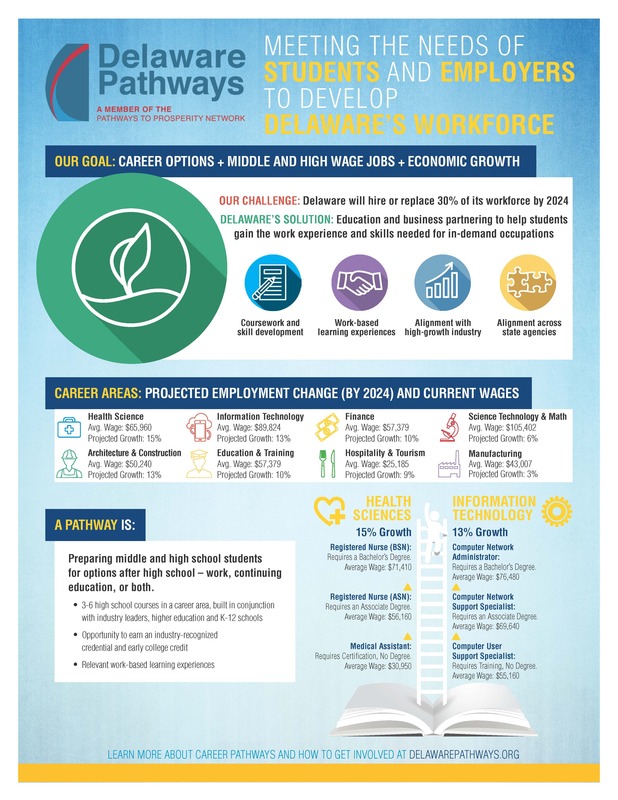 Delaware Pathways (2016): A collaboration between Delaware school districts, higher education institutions, businesses, and nonprofits aimed at equipping Delaware students with the knowledge, skills, and experience to successfully transition to high-growth, high-demand occupations. Delaware Goes to College (2016): The Delaware Department of Education’s (DDOE) Higher Education Office website focused on increasing college access and success, college affordability, higher education partnerships, and communicating this work to parents and students. Strategic Data Project College Going Diagnostic (2013): Using six years of data from DDOE and the National Student Clearinghouse, the diagnostic examines students’ progression through high school, how well they stay on track for graduation, and whether they enroll and persist in postsecondary education. College Board 2017 State and District Integrated Report: Delaware Public Schools. (2017). This resource provides the latest results for how Delaware performed on the SAT, PSAT, and AP courses. Students, parents, and employers can take advantage of the various programs and advocacy opportunities available for helping students get prepared for college and career. Explore careers with Delaware Pathways. See what Pathways are available at which schools, how students can get hands-on, work-based learning experience or information on how parents can support students in career training. Advocate for your students. Attend a P-20 Council meeting to learn how your state is supporting Delaware education efforts from all grade levels (including post-secondary). Make sure your student is college ready. Check out the Delaware Goes to College website for ways to support students in applying for college, paying for college, and planning for a successful career. Provided below is a non-exhaustive list of community-based organizations working to support high school aged and/or young adults in college and/or preparation, counseling supports, tutoring, and social and emotional supports. Notice something missing? Send us a message so we can add to this list.